Or maybe the term should be "old silicon"? Either way, I've a fascination with vintage computers. 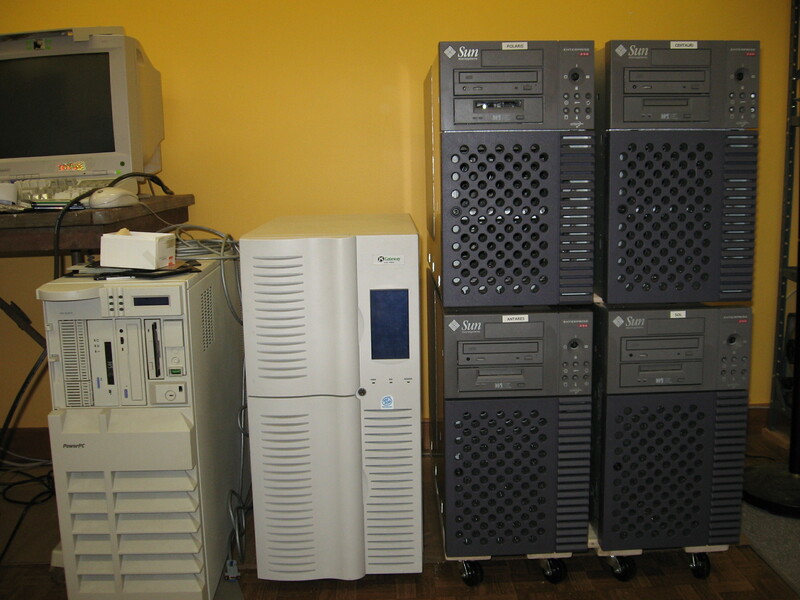 Besides a few branded "dinosaurs", I've a collection of beige-box machines, built around Intel's venerable Pentium Pro processor. During the colder months, most of those machines run Seti@Home and keep my garage nice and toasty. The links at left will take you to pages featuring some of my vintage systems. This was Tommy's senior dorm room. He paid extra to have the whole room to himself so he'd have enough room for his computers. To get more systems into a smaller space, he mounted bare motherboards directly to a shelf framework and cabled them to bare power supplies and drives, above and below. 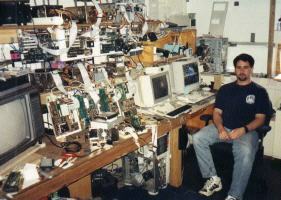 At the time, he was contributing processor cycles to the Distributed.net project. How many systems can you count? 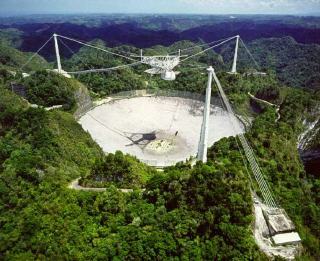 The Arceibo Space Telescope in Puerto Rico scans the sky for signals. The collected data is divided up into work packets and distributed to volunteers' computers for analysis. This distributed analysis project is called Seti@home. I've had computers running Seti since May 1999 and have contributed over 34 "computer-years" of processor time using the command-line, "classic" version.